rec. live 17-18 April 2004, First Congregational Church, Berkeley, California. �Audi, Fili� recorded without an audience, 20 April 2004 at the same venue. Though we have assimilated many of the performance practices of previous eras, we still tend to cling to perceptions based on the 19th century concept of the artist; preconceptions which may have little place in music of the baroque era. The idea of a work of art, a complete-in-itself masterwork is one of them. It can be difficult for us to apprehend the copious quantities of music written by baroque composers and we focus on ways to assemble these disparate elements into what we perceive as proper complete works. As a result, we tend to fix on events which allow us to bring coherence to what we see as a chaotic oeuvre. These events might be a particular occasion (the reconstruction of a service for instance) or a publication; baroque composers published assemblages of pieces with the intention that performers might cherry-pick from them and would be a little surprised at our tendency to routinely perform all the pieces together as a complete entity. 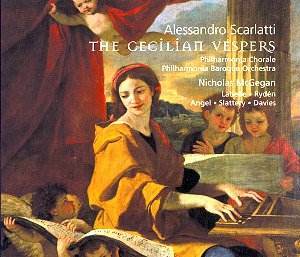 This effect has now hit Alessandro Scarlatti; recent scholarship has enabled Nicholas McGegan and his Philharmonia Baroque Ensemble to make the first complete recording of Scarlatti�s St. Cecilian Vespers. Scarlatti wrote a number of works for the feast of St. Cecilia, including a Mass, various antiphons and hymns and this setting of the vespers service. The vespers service attracted many baroque composers, but generally services were assembled from a variety of musical sources; during the baroque period there was little concept of a coherent vespers service written by a single composer in the same way that a mass would be. Remarkably, Scarlatti produced this complete vespers service, for Cardinal Acquaviva and his newly consecrated Church of St. Cecilia in Trastevere, Rome. We know that music by Scarlatti was performed there in 1720 and parts of the St Cecilian Vespers were performed in November 1721. But we don�t really know whether the entire service was performed in one go, or whether it was simply mined as a source book. Whatever the truth, we should be grateful to McGegan for providing us with the opportunity to hear so much magnificent music; even if the circumstances might smack more of 19th century Romanticism than a genuine baroque event. Scarlatti specified the Gregorian antiphons which would introduce the psalm settings and provided concerted versions of the antiphons for performance after the psalm settings. Here, another element of Romanticism might be detected. McGegan and his forces perform the Gregorian chant versions of the antiphons in pure, unadulterated, unaccompanied chant (and very good they sound too). This provides a wonderfully Romantic contrast with Scarlatti�s highly developed music. But in his recording of Vivaldi�s music for vespers on Opus 111, Rinaldo Alessandrini performs antiphons based on the 18th century practice, using on a set of parts printed in Rome during the 18th century; these use accompanied solo voices and the chant is �corrected� to form satisfying verses and recitative. So it would seem unlikely that Scarlatti ever heard his vespers performed with pure Gregorian chant antiphons. So, having fought our way through this thicket of speculation and reconstruction, what of the music. McGegan and his orchestra and chorus are in fine form, delivering superbly crisp performances. McGegan favours quite brisk tempos and his orchestra and chorus make light of this, delivering sparkling performances. The first psalm setting, Dixit Dominus, uses all 5 soloists; Scarlatti often using them in a manner akin to the concertino group in a concerto grosso, rather than giving them extended solos. He writes vocal lines which are often highly decorated and it is here that the performers rather fall down. All five soloists are distinguished artists with a good pedigree in period performance. But in Scarlatti�s elaborate vocal lines they sing the more complex passages in an unsatisfactorily laboured manner with the passage-work sounding, at best, smudged. This only happens in some passages (presumably the more difficult ones) at other times all contribute moments of great beauty. Quite who is to blame I am not sure. The singers do sound as if they are recorded rather closely, and this is a live recording. I am sure that someone present at the performance, with the benefit of the acoustic of the First Congregational Church, Berkeley, would have had a rather happier experience. Also, I did wonder about some of McGegan�s tempi; whether he should have eased up a little and allowed the soloists more leeway. In the Laudate Pueri just one soloists is featured, soprano Dominque Labelle, and she seems to be, on the whole, more comfortable; her winning manner of performance, allows you to forget the imperfections. For the 3rd psalm, Laetatus sum, Scarlatti returns to the same concerted use of soloists has Dixit Dominus. On disc 2 the Nisi Dominus is set for chorus and orchestra only, as is the Magnificat; both of these are entirely delightful experiences. The hymn, Jesu corona returns to using all 5 soloists. The disc is completed by performances of another Nisi Dominus setting with solos for soprano Susanne Ryden and counter-tenor Ryland Angel, a Salve Regina with solos for Soprano Dominique Labelle. And the disc concludes with a setting of the Gradual for St. Cecilia�s Day, Audi, fili. This is a first recording of this lovely music and on the whole, I will look forward to returning to it. But I know that the imperfections in the vocal delivery will annoy me on repeated listening, others may be more tolerant than me. What the recording did do, though, is whet my appetite for more of Scarlatti�s sacred music; how about a recording of some of the plums without the conceit of a service reconstruction.